After consulting with PM Saad Hariri during this morning’s session, Speaker Nabih Berri said: “The night will extend till its end,” signaling the session would remain open till MPs finish their debates and vote on confidence in government. Commenting on the relations with Syria he said : I was receiving the Syrian army in 1975 with former president Amin Gemayel in Bikfaya with roses. Gemayel visited Syria 11 times, eight of which I was with him, and now the Syrian presence in Lebanon is considered an occupation. Commenting on relations with Syria he said “the special relations between Lebanon and Syria are a vital necessity for geographical and political reasons in addition to the historic and national identity . He stressed that this special relationship requires openness, cooperation and should take into consideration the mistakes of the past. ” He dded: There should be a mechanism to address all issues with Syria, such as the missing Lebanese detainees in Syrian prisons , delineating the international borders between Lebanon and Syria and treaties between both countries. 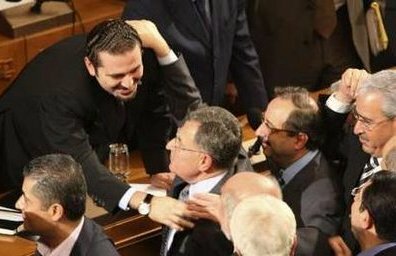 Zahle MP Nicolas Fattoush attacked PM Hariri and March 14 by saying : I had asked you whether you object on designating me as minister and your answer was that you have allies whom you can’t abandon, but you have abandoned me. He added “Zahle deserves the “eyes” of the majority, but instead of giving it their eyes, they turned their “glass eye” toward it. Zahle contributed to the March 14 alliance achievements; the March 14 leaders are taking away the city’s dream.” Fattoush said he will deny the vote confidence to the cabinet because he can’t imagine any sane person or official who is pleased with this government. After Fattoush’s statement, MP Boutros Harb asked Speaker Nabih Berri to delete “insults” against Hariri and March 14 from the parliamentary session minutes. Berri answered by reassuring Harb that what was considered as insulting was already deleted. DL MP Anwar al-Khalil: There is a golden chance for the Lebanese through this government that consists of the majority of the political factions. We commend its commitment, as spelled out in the Ministerial Statement, to the Taef Agreement and constitution. We commend the cabinet’s position on liberating the land with the army, Resistance and people and on improving the Lebanese-Syrian relations and relations with the Arabs as well as its commitment to administrative decentralization. Commenting on corruption he said : Unfortunately, Lebanon ranked 130th in terms of corrupt states. Tripoli Bloc MP Mohammed Kabbara said : We demand to preserve the Constitution and to implement all of its articles. We demand not to harm the Constitution neither through practice nor through amendments that undermine the formula of coexistence.